Is it someone who is super strong, healthy and with enviable muscles? Far from it. It's the everyday champion who braves daily traffic for an even busier working day ahead. It's the hardworking mum and dad who pursue better lives for their kids. It's those who actively pursue goals on the go. A " superhero" lives in all of us and mega living as such deserves the power of "C' for healthier lives! The question is, how many oranges do you eat or squeeze to drink to ensure a healthy dose of vitamin C every day? Refreshingly delicious, it's hard to refuse a glass of orange juice to kickstart a busy "relentless" day. Seriously, how many "superheroes" like us even have the time to squeeze oranges as we dash out the door each day or even think about the nutrients it provides to keep us on the go? Since our body does not produce vitamin C, it must be obtained from "outside-the-body" sources. Besides oranges, vitamin C is widely available in nature and found in other "fruitlicious" fresh fruits such as guava, mango, papaya, citrus fruits and juices, tomatoes and tomato juices including leafy vegetables and animal sources (meat, fish, poultry, eggs and dairy products). However, it is also the least stable vitamins and easily destroyed during processing and storage! Did you know that body stores of vitamin C can be affected by dietary intake, metabolic losses, renal "urine" excretion and faecal losses? Interestingly as vitamin C is one of the nutrients sensitive to stress, it is also the first nutrient to be depleted in alcoholics, smokers and obese individuals and, it makes it a marker for overall health! With our love for delicious foods and "sometimes" not so healthy offerings amid busy and sedentary habits (in some! )., how do we 'power-up' to meet hectic lifestyle demands? Bio-LIFE Marketing Sdn. 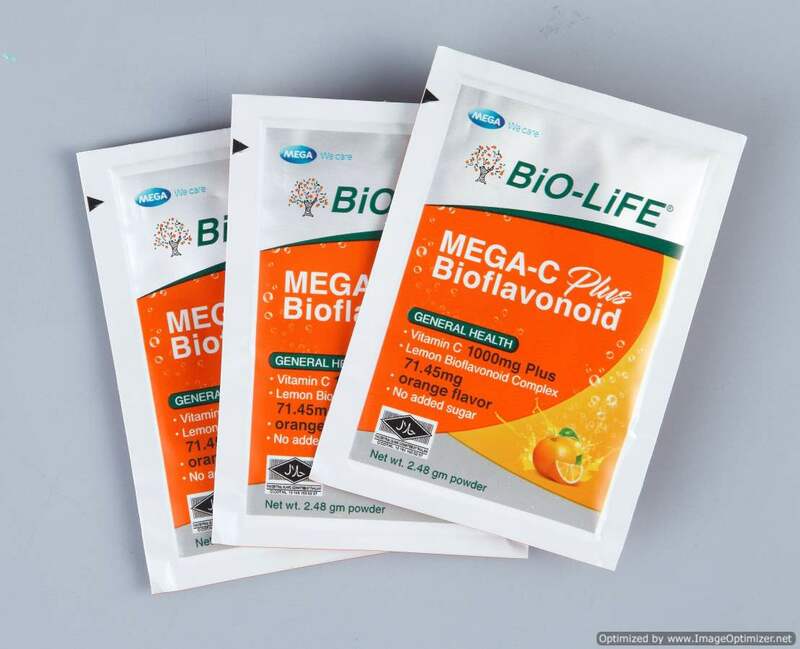 Bhd., is a part of MEGA LIFESCIENCES (one of the leading pharmaceutical and nutraceutical company headquartered in Bangkok) and a proponent of 'Prevention is The Best Medicine' , unveiled the new MEGA-C PLUS Bioflavonoid, a vitamin C in sachet form in Malaysia that meets the needs of busy individuals who are always on the go! 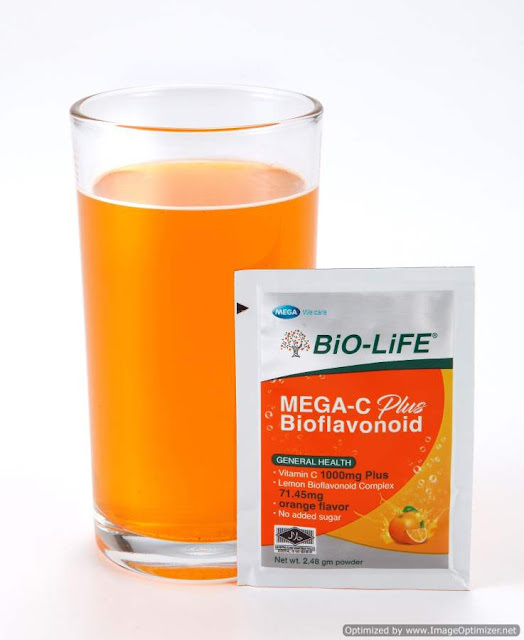 Available in orange flavour powder form in convenient once-a-day sachet, the MEGA-C Plus Bioflavonoid is a high strength vitamin C in calcium ascorbate enriched with bioflavonoids. 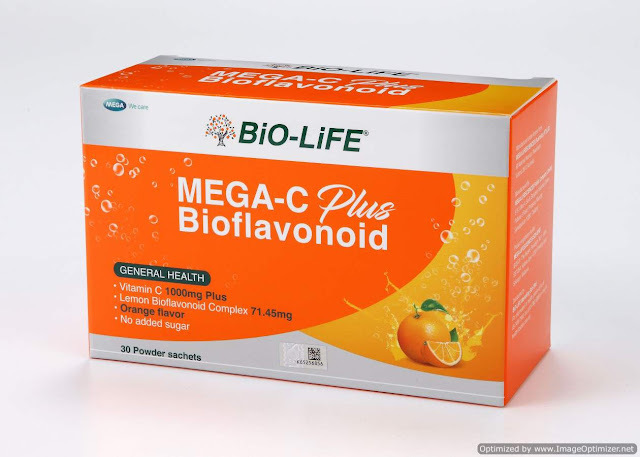 As vitamin C is a water more soluble vitamin, the bioflavonoids help to increase the absorption and utilisation of vitamin C in the body. For those with gastric issues, the buffered MEGA-C Plus Bioflavonoid in ascorbate form of neutral pH does not irritate stomachs! 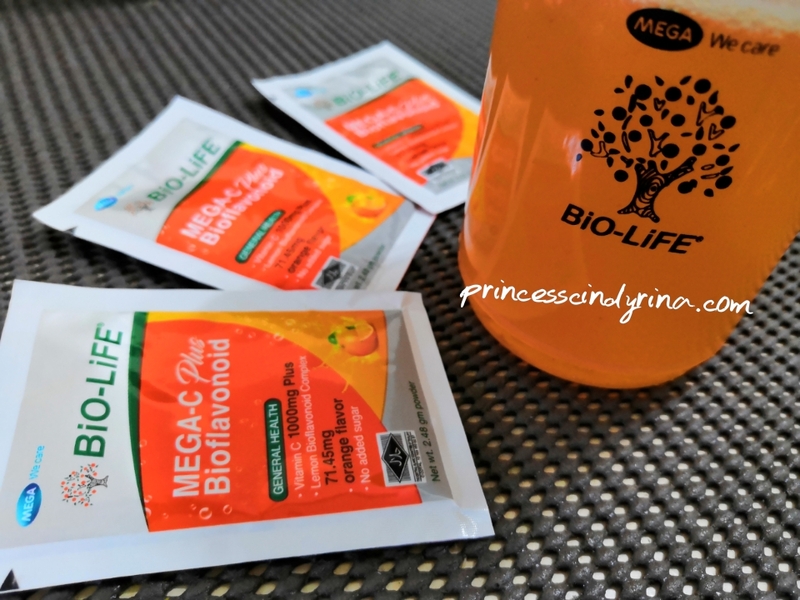 Pack for convenience to meet modern lifestyles needs a vitamin C deficient individuals, the single sachet packing of MEGA-C Plus Flavonoid helps preserve its 1000mg vitamin C content for added benefits. 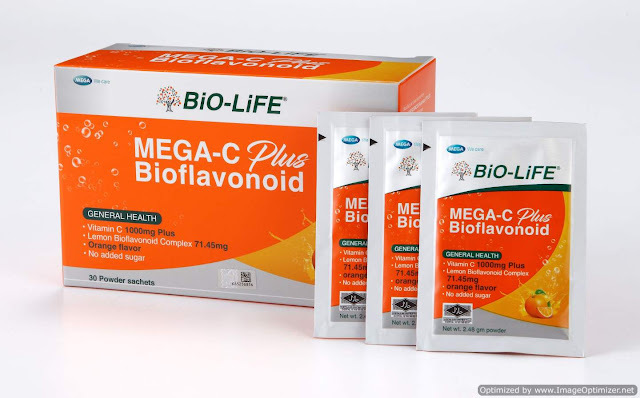 So how does one consume MEGA-C Plus Bioflavonoid each day? Whenever just dissolve one sachet with a glass of cool water and drink once daily. Super convenient! Suitable for all ages 12 years and above namely, busy and active working folks, travellers, the elderly, people with poor health too., the no-sugar-added MEGA-C Plus Bioflavonoid comes to you in a box of 30 sachets and retails at RM55 per box. It's available at all leading pharmacies nationwide including Caring, Guardian, Watsons and independent pharmacies. * For collagen formation, a protein that gives structure to bones, cartilage, muscle and blood vessels. hahah alamak macan terkena pada diri sndiri..memang tak rajin lah nak buat air oren sendiri (homemade) dah lah kurang makan buah..so paling mudah just take bio life ni lah kan..i shud try this one! Vitamin c is very important for our body but because of time limitation, many of us ignore about this. But with this easy consume Mega-C Plus, no more excuse. Super convenient to drink. I must say, I would prefer vitamin c in this kind of packaging. It is easier to consume and hygienic too. Long time Im not taking any Vit C supplement. Nampak macam air oren dan mudah la nak minum setiap hari. Im aware that Vit C ni water soluble, dan mudah sangat hilang dalam badan. So kena lebihkan makan makanan yang ada Vit.C. Sedapnya tengok air oren tu hehehehe kita nak juga nak nampak sentiasa sihat dan juga mendapat power macam super hero hehehehe... Mesti sedapkan rasanya tengok jer dah meliurkan air je pun wakakkaka..
Nampaknya untuk kesihatan boleh dapatkan bio life ni. Bagus ye supplement Vit C ni. Banyak juga kebaikannya pada kesihatan badan. Pada mereka yang suka supplement macam ni, bolehlah cuba. Saya pula suka makan buah oren segar. I've been looking for a good Vitamin C supplement to take daily. Thanks for suggesting this. It tastes delicious right? Would love to try this too. Ena memang suka supplements yg ada vit c. Badan rasa cergas. Cuma tak pernah cuba brand ni. Memang jenis malas potong buah n makan hari2.hehe.. minum bancuh camni lg mudah. Yeahh, our body need vit c and sometimes our body didnt produce it because of some reasons. It is good to have this kind of supplement that can provide vit c to us. Vitamin C is important to keep us healthy. Mouse mommy also taking Guardian brand vitamin C.